It’s no secret that when TNCs operate in the developing world they leave destruction in their wake. This destruction goes beyond the low environmental impact that pro-agencies assure us is the only problem. It devastates entire communities and leaves their environmental surroundings irreversibly damaged. In August, the first session of the Southern Africa Permanent Peoples’ Tribunal on Transnational Corporations (PPT) took place in Swaziland. It launched a major process to hold these TNCs accountable for their actions. And it provided a platform for the struggles of communities from the SADC region who are all fighting to dismantle corporate power and stop the impunity of TNCs. These corporations are violating their human, environmental and socio-cultural rights with the collaboration of the elite. The Alternative Information and Development Centre (AIDC) coordinated the Tribunal, along with a reference group of representatives from seven partner organisations. 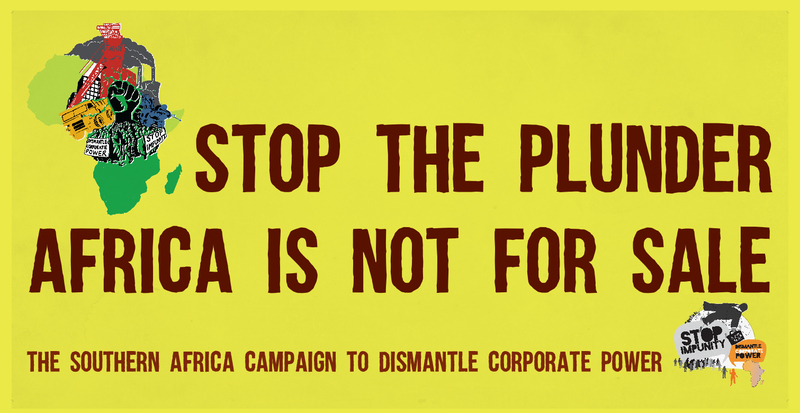 The Tribunal is the jump-start of the Southern Africa Campaign to Dismantle Corporate Power, the regional leg of the Global Campaign to Dismantle Corporate Power, Stop Impunity and Reclaim Peoples’ Sovereignty. Network (SAPSN), an annual event that usually takes place at the same time as the SADC Heads of State Summit. Lucy Edwards-Jauch, and political economist and eco-feminist Donna Andrews. As the communities presented their cases, the hum of translators could be heard, into Portuguese, Zulu, and Sena. This was a reminder of the diversity of countries and languages participating in the Tribunal. The participants showed immense bravery in speaking out. The Amalgamated Trade Unions of Swaziland Participants at the TNC tribunal in Swaziland.took a big risk – anyone speaking out against the Swazi government is immediately punished. One of the jurors knows that first hand. Maseko was jailed for standing up to the monarchy. He was arrested in 2009 and charged with sedition and subversive activities while he was representing Mario Masuku, head of the banned People’s United Democratic Movement (PUDEMO). And he was jailed in 2014 for contempt of court after he criticized the Swazi judicial system. Both the jurors and audience were struck by the experiences of the communities presenting their cases, and their determination and commitment to bring about justice. Many themes arose from this tribunal. Women and resistance, workers’ rights, and land and agricultural sovereignty were the most prominent. Each of these deserves a tribunal on its own. It became clear that this is the beginning of a process that is much bigger and more powerful than we had expected. The tribunal fulfilled its goals: to create a platform for communities and movements to present their cases and struggles to a larger Southern African audience. Many of the communities and movements represented are isolated. The tribunal provided a safe space for them to network and learn from each other’s experiences, in order to strengthen a joint struggle and find ways forward. While we always believed in the tribunal and the impact it would have, we never imagined the enormity of what it has birthed. The entire process of the immediate future of the campaign has shifted. We initially planned to hold two sessions of the tribunal – after this one, a second session in May 2017. But this will not be nearly sufficient. There are too many stories that need to be told. And there is a great need to mobilise to fight the regime of state-enabled ravaging of the land and peoples of Southern Africa. It is now that the work begins. The Southern Africa Green Revolutionary Council from South Africa presented on Glencore’s notorious coal operations in the Mpumalanga province. These are a major contributor to South Africa’s violations of labour, human and environmental rights. Mpumalanga is home to several coal mines and smelters owned by Glencore and its subsidiaries. In April, striking mineworkers at the Wonderfontein mine were shot at while protesting outside the mine. The surrounding communities suffer from lung illnesses, live in cracked houses due to blasting, and have no water in what were once large ponds for their cattle, because the mine consumes it. The mine is also operating without having submitted an environmental license and violates several of the conditions in its social and labour plans. The nearby Graspan mine creates the same destructive impacts on the surrounding community and area, with the nearest house less than a kilometer from the mine´s entrance. Justica Ambiental (JA!) testified on Indian company Jindal’s activities in Mozambique. This company started its operations before their Environmental Impact Study was approved. More than 500 families from the communities of Cassoca, Luane, Cassica, Dzindza and Gulu have been affected. Some communities continue to live within the mine concession area and are subjected to inhumane living conditions. JA! also presented a Mozambican case on Brazilian company Vale, which owns the fourth largest coal mine in the world, in Tete Province. This area is known as the ‘wild west’ because of the lawlessness of mining security and police. 716 families from the communities of Chipanga, Malabwe and Mithete were resettled to Cateme. All families are small scale subsistence farmers and many are now facing extreme difficulties as most plots are not suitable for agriculture. There have been many protests and denunciations from the communities, usually handled with violence and repression from the police and the company. From Zimbabwe, the Centre for Natural Resource Governance presented the case of artisanal miners struggling to work in Penhalonga. This is an area mined by Russian state-owned company DTZ-OZGEO. There are deep issues arising from the gold mining operations, which are shrouded in secrecy. They include the murder of an artisanal miner and the mining of a river bed which has had devastating effects on the environment. Artisanal miners regularly face violence from mine security. The Centre for Trade and Policy Development presented a Zambian case on Glencore’s Mopani copper mines and their contribution to the pollution of land, water and air. This is particularly due to the uncontrolled emissions of sulphur dioxide. This dramatically affects the local populations. It causes severe respiratory diseases, as well as contamination of the fauna and flora upon which the local people depend. In addition, independent audits have revealed major tax avoidance through transfer of profits to tax havens. This robs governments of much-needed revenue to meet the socio-economic needs of people. The Amadiba Crisis Committee presented the struggles of the community of Xolobeni in the Eastern Cape. They have been met with intense hostility for their actions against Australian titanium mining company MRC, and the irreversible damage they are doing to the environment and community. Amandla! has previously reported on the assassination of activist Sikhosiphi ‘Bazooka’ Rhadebe. Xolobeni is one of the largest undeveloped mineral sands resources in the world, containing more than nine-million tons of ilmenite. MRC also owns the Tormin mineral sands project on the west coast of South Africa. WoMin also presented on Fuleni, the wilderness segment of the iMfolozi Game Reserve. Communities are fighting iButho Coals’s application for a mining license. This mine would cause an existing water shortage in the area to become even more dire as the mine would use water from the Mfolozi river. The new mine is likely to destabilise a cohesive community, and the noise, water and air pollution will threaten the existence of the wildlife. 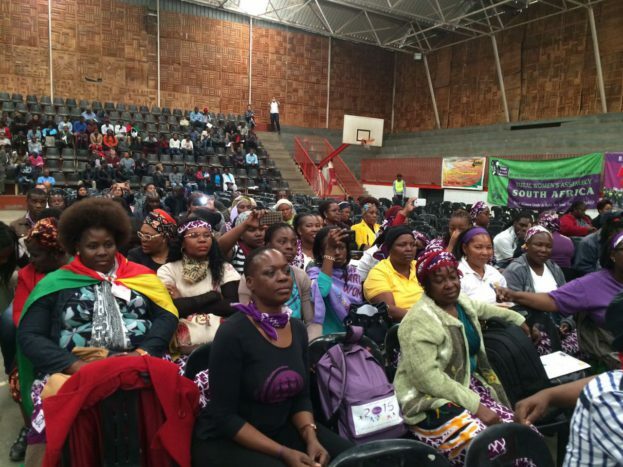 South African organisation WoMin presented a case by the women of Somkhele in the struggle against an anthracite mine. Tendele Mining’s Somkhele Mine borders the iMfolozi game Reserve in KwaZulu Natal. It has led to cracks in the homes of the surroundingcommunity due to blasting, and illness from coal dust permanently in the air. Anti-mining activists are often afraid to voice thei thoughts, risking violent attacks from those in the community who have been given outsourcing contracts by Tendele. The Amalgamated Trade Unions of Swaziland presented a case on the Maloma Colliery owned by Chancellor House and the Swazi government. The mine is responsible for cracked houses from blasting, and pollutionof the nearby river leading to illnesses in the surrounding communities. Rawoot is the Southern Africa coordinator at AIDC and the coordinator for the Southern Africa Campaign to Dismantle Corporate Power.